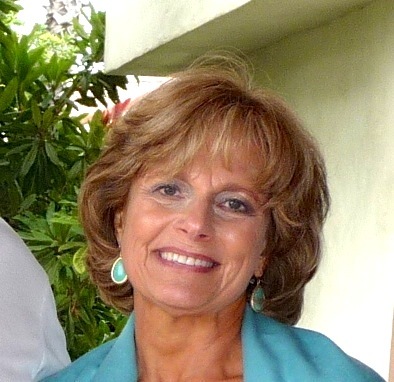 About six years ago I started experimenting at home because I didn’t like the high sugar and fat content of what I found in the stores. I played around with lots of recipes, including Bon Appetit’s A Better Granola (February 2013) and Cook’s Illustrated’s March 2012 Almond Granola with Dried Fruit, as well as several on the excellent Orangette blog. After reading a slew of recipes and baking many batches, I came up with a basic recipe I like. Start with these ingredients. Simply stir the dry ingredients in a large bowl; I use the one from my stand mixture because it’s big and deep and I am therefore less likely to splatter stuff all over the kitchen when I mix it up. Combine the oil and sweeteners, stir everything together, press in a pan, and bake. Adapt it by varying the spices and add-ins, such as type of nuts, seeds, dried fruit, and coconut. I add ground flax for additional nutritional value and like coconut chips better than flaked coconut, though either is fine. Hate cinnamon? Leave it out. Love ginger? Add lots, both powdered and candied. In the fall you may want to add pumpkin pie spice and pumpkin seeds. Another time try orange zest with dried cranberries. How about mini chocolate chips? In the summer, try dried blueberries and peaches: yummy! Or forget about dried fruit and add fresh fruit when you make a yogurt parfait. The sky’s the limit! 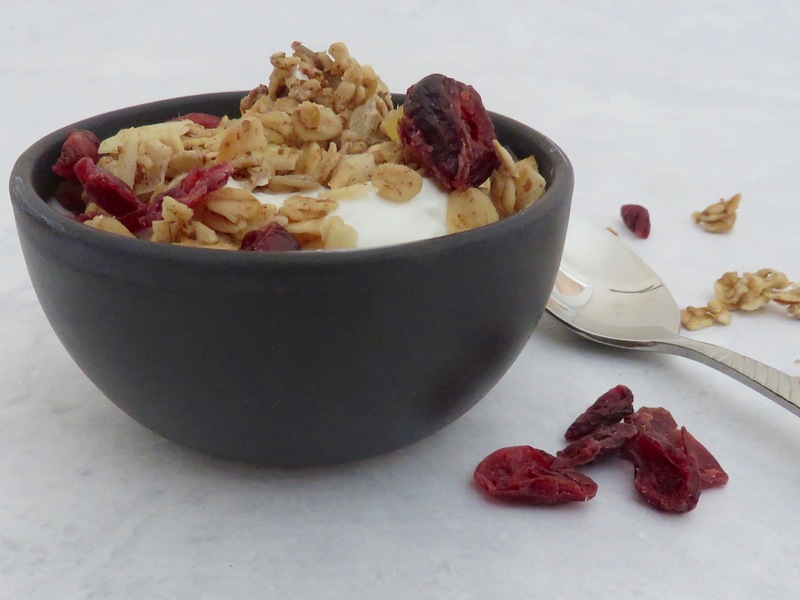 I’ve been gifting granola at holiday time as well as taking it as a hostess gift. I package the add-ins separately, in case the recipient doesn’t like my choices. That way no one has to pick out the raisins or ginger! Use regular old-fashioned oats. Quick oats don’t work well because they are too soft and won’t yield good clusters. You need some sweetener, though you can control how much. 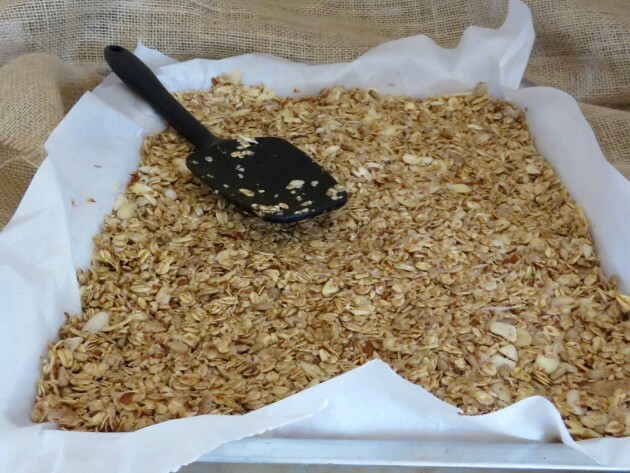 I don’t like really sweet granola and find that ¼ cup maple syrup and a bit of brown sugar is just right for me; you can substitute honey or agave. Salt gives it a savory touch and balances the flavors. Adding an egg white helps the clusters stick together. Thinking about leaving out the fat? Don’t! It’s what forms the yummy run crunchy clusters. I use about ¼ cup for 3-4 cups of oats. Olive and canola oil work well, as does melted coconut oil. I haven’t tried nut or other oils or melted butter, but they would be good, too. Press the granola firmly into the pan. I put a piece of wax paper on top and press down with my hands or a spatula. Bake at a relatively low temperature and watch carefully, as ovens vary. You want the final product to be crunchy but not too brown. Don’t stir while baking if you want clusters! As much as you want to dig right in, let it cool before you break it into the size of clusters you like. 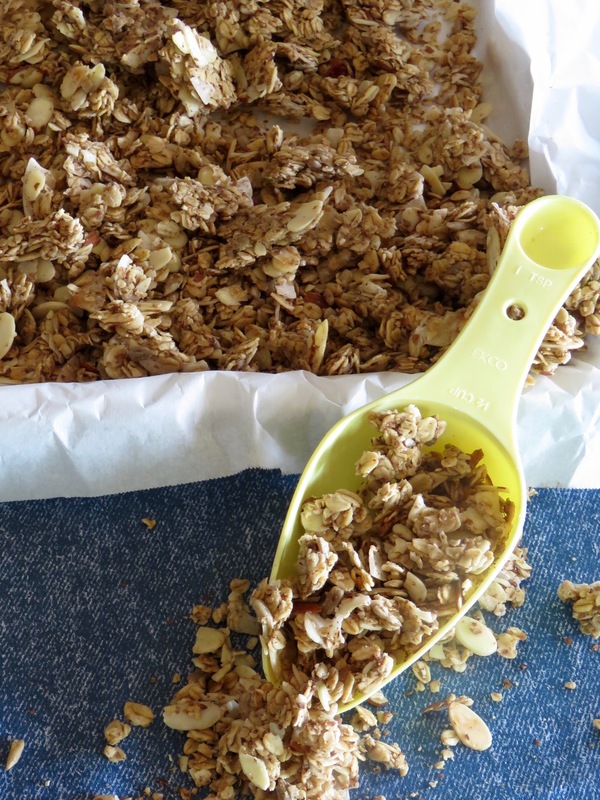 Add the dried fruit after you bake the granola so it stays moist. What wonderful combinations will you make? Please share your favorites. 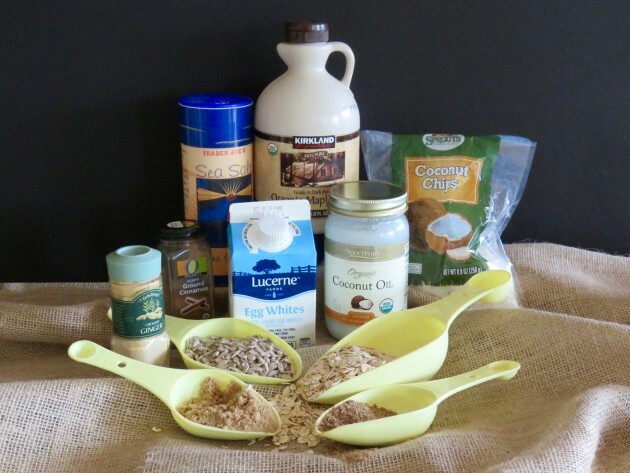 The basic recipe starts with these proportions of oats, nuts, oil, salt, egg white, and sweetener. It’s very forgiving, however, and flexible in terms of the additional ingredients. The recipe can be doubled. Preheat oven to 325ºF. Line a rimmed baking sheet with parchment paper or spray it with nonstick cooking spray. 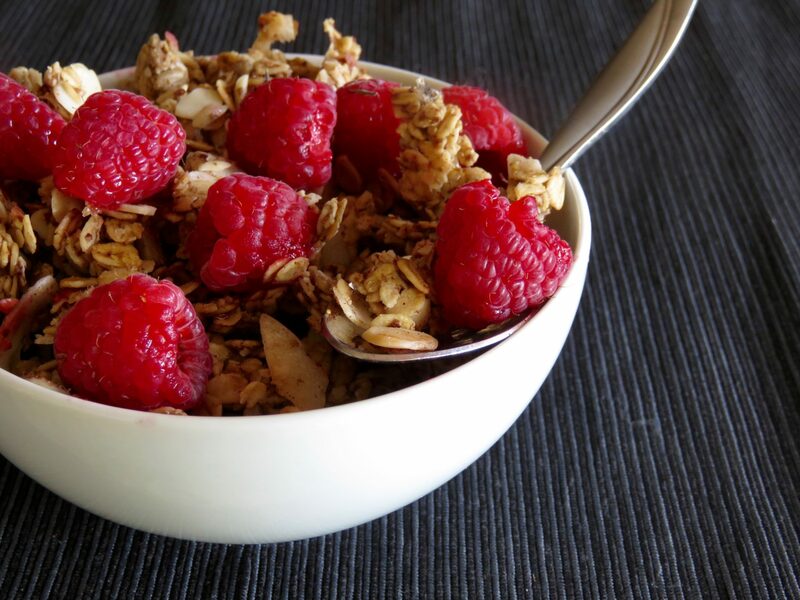 Mix dry ingredients—oats, nuts, seeds/wheat germ, coconut chips, salt, cinnamon or other spices—in a large bowl. In a measuring cup combine oil or melted butter, maple syrup, and brown sugar and stir well. Add liquids to dry ingredients and mix thoroughly. Stir in egg white. Press mixture very firmly into prepared pan in an even layer. Bake without stirring for about 30-40 minutes, rotating the pan at 20 minutes. Check at about 25 minutes to make sure it’s not getting too brown. Continue baking until light golden brown. Cool in pan for about an hour before breaking into clusters. 1. Options include coarsely chopped almonds, pecans, peanuts, walnuts, cashews, and pistachios. Hand-chop them for the best texture. Feeling lazy? Reach for the slivered or sliced almonds. 2. If desired, toast the nuts a bit while the oven is preheating and you are mixing the other ingredients. Watch them carefully do they don’t burn. I’ve had to throw out more than a few batches I did in the toaster oven. 3. Other spices and flavorings to consider include ground ginger, nutmeg, pumpkin pie spice, vanilla, and orange zest. 4. Agave or honey are good, too. 5. About ¼ cup liquid egg whites from a carton equals one large egg white. 6. 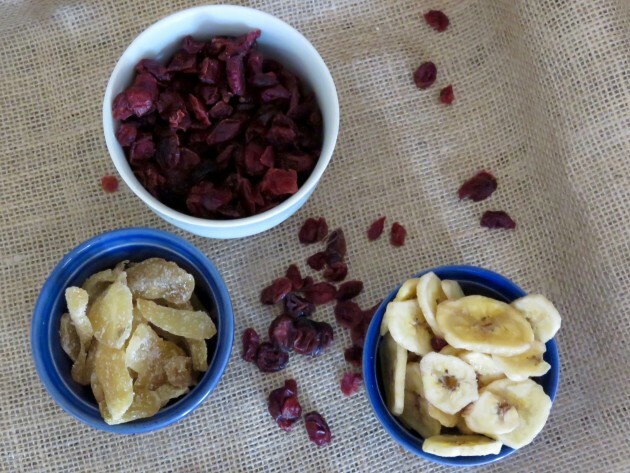 One of my favorites combinations is cranberries and chopped crystallized candied ginger. 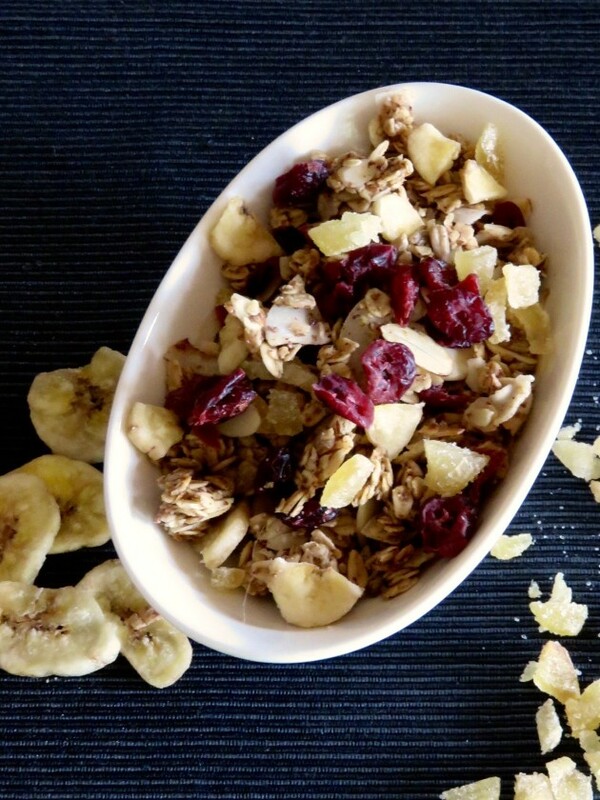 Raisins, dried apples, apricots, banana chips, figs, blueberries, cherries, and dates are other possibilities. To go tropical, choose from dried mango, papaya, pineapple, and macadamia nuts. 7. For a gluten-free version, use GF oats and sweeteners. I can honestly say I have never ever bought granola since making my own. Thing is, even if I don’t have everything I want in it, as long as I have oats and some nuts or dried fruit, I make do 🙂 I’m totally with you about portion control issues too! !